What to make of new poll on global climate disruption? Here's Bjorn Lomborg, apparently trying to curry the favor of fossil fuel funders with another piece that talks down clean energy and that wholly ignores the staggeringly large dirty energy welfare. The self-proclaimed "libertarian" Cato Institute is out with new "research" and policy recommendations for the Interior Department, and specifically regarding how they believe the treatment of federal lands should be reformed. Unsurprisingly, given Cato's track record as pro-corporate, anti-environmental shills, the main recommendations center around giving federal land to the states, along with selling off federal lands to individuals or even corporations. What is a bit surprising, however, is what Cato leaves out of its analysis: namely, a complete failure to point out how extremely cheap corporate (e.g., mining, oil and gas drilling) access to public property happens to be. This past Friday afternoon, an important new report, an "Independent Consultant's Review with Respect to the Department of Energy Loan and Loan Guarantee Portfolio,” was released by the White House. Clearly, wind power technology is advancing, and wind power generation costs are coming down, the only questions being “how fast” and “will that trend continue?” A new presentation (“Recent Developments in the Levelized Cost of Energy from U.S. Wind Power Projects.”) by researchers at the Lawrence Berkeley National Laboratory (LBL) and the National Renewable Energy Laboratory (NREL), following up on an October 2011 report (“Understanding Trends in Wind Turbine Prices Over the Past Decade”) by the same people, provides us with answers to those questions. 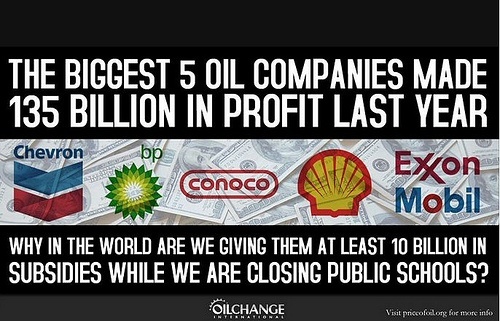 That's right, profits at the "Big 5" U.S. oil companies in 2011 exceeded $130 billion, even as they continued to receive taxpayer-funded corporate welfare from the government. To read more about "the big, the bad and the subsidized," please click here.